Church Interiors provides the latest church hardwood and porcelain tile flooring. Your worship space will be enhanced by the collection of designed materials selected by our interior designers. Our main goal is to brighten as well as enhance the natural sound of the choir area, chancel area and under pews in the sanctuary. 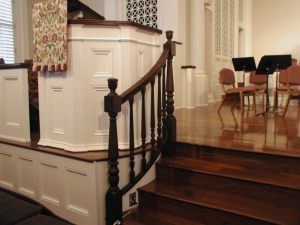 New hardwood flooring is often selected to replace carpet from the choir and platform areas. 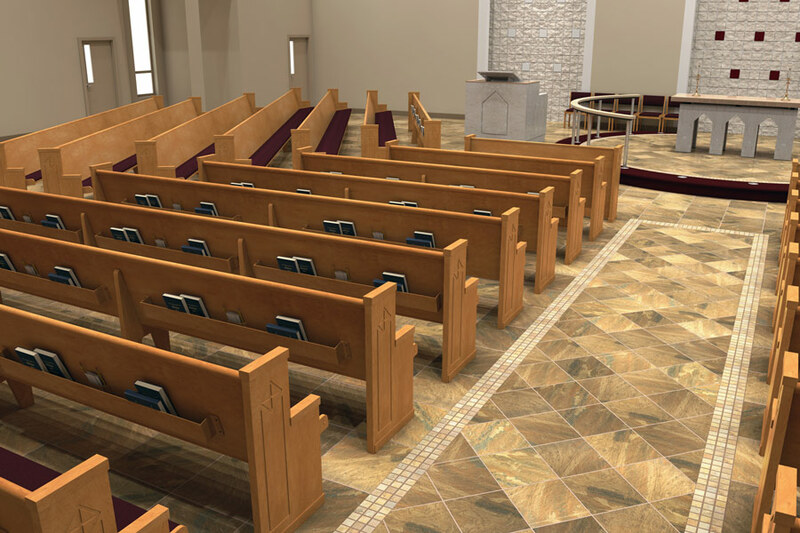 The new hardwood flooring will often be designed to match the stain of the other furnishings, pews and millwork throughout the sanctuary. New high traffic carpet, porcelain tile and hardwood floor can also be provided for other areas of your church including vestibules, narthex and entry hall. Our designers will create an inviting, durable and functional space with new furnishings and seating specially designed for entry halls and foyers. Customize your remodeling, renovation or new design project with custom tile designs and stone flooring options by our craftsmen. Create a truly unique and reverent worship space for your facility. Call us today to schedule a free consultation.